A SpaceX Falcon 9 rocket is seen just before landing on the drone ship "Just Read the Instructions" in the Pacific Ocean in this spectacular photo captured on Jan. 14, 2017 just after the rocket launched 10 Iridium NEXT satellites into orbit. If you needed any more proof that SpaceX is back after last weekend's successful rocket launch, look no more. The private spaceflight company not only launched 10 communications satellites into orbit during its Falcon 9 launch Saturday (the first for SpaceX since a Sept. 1 explosion), but also returned the rocket back to Earth for a picture-perfect landing. And the picture is definitely perfect. Seen here is the first stage of SpaceX's Falcon 9 rocket as it prepares for landing on "Just Read The Instructions," an autonomous drone ship in the Pacific Ocean. The rocket's landing legs are seen deployed here as one of its nine Merlin rocket engines fires to make the controlled landing. Two of its four grid stabilizers, used to control the rocket's descent, can be seen extending from the top of the booster. The entire rocket is silhouetted by the sun, creating a truly spectacular sight. SpaceX launched the Falcon 9 into orbit Saturday (Jan. 14) from California's Vandenberg Air Force Base at 12:54 p.m. EST (1754 GMT or 9:54 a.m. PST) on a mission to deliver 10 Iridium NEXT mobile communications satellites into orbit before making its successful descent back to Earth. A camera on the Falcon 9 booster beamed video of the entire descent to Earth as it happened. Another view of the Falcon 9 landing (SpaceX posted the new photos via Flickr on Wednesday, Jan. 18) shows the booster just seconds before touchdown, its Merlin engine spitting flame as the rocket hovers over a bull's-eye-like landing target on Just Read The Instructions. The SpaceX Falcon 9 rocket booster is seen just seconds before landing in this photo captured from the company's drone ship "Just Read The Instructions" on Jan. 14, 2017. The successful rocket landing was the seventh for SpaceX. A third landing photo shows a middle view of the Falcon 9's descent, a second between the jaw-dropping silhouette view but just before the final touchdown. The rocket's white paint and SpaceX logo appear blackened from the extreme conditions during the re-entry and landing. The launch was SpaceX's first since a Sept. 1 explosion during a routine launchpad test destroyed a Falcon 9 rocket and its payload, the $200 million Amos-6 communications satellite, at the company's pad at Cape Canaveral Air Force Station in Florida. SpaceX traced that explosion to a failure in a high-pressure helium vessel inside the Falcon 9's second-stage liquid-oxygen tank. This SpaceX photograph captures the company's Falcon 9 rocket just before it landed successfully on the drone ship "Just Read The Instructions" in the Pacific Ocean on Jan. 14, 2017. SpaceX has been landing rockets in the pursuit of a fully reusable rocket system to lower the cost of spaceflight. Saturday's landing was SpaceX's seventh successful Falcon 9 rocket landing, and the first on Just Read The Instructions. Five of the other landings touched down on SpaceX's other drone ship, named "Of Course I Still Love You," in the Atlantic Ocean after launches from Cape Canaveral Air Force Station. The remaining landing occurred on land on a SpaceX pad at the Air Force station. 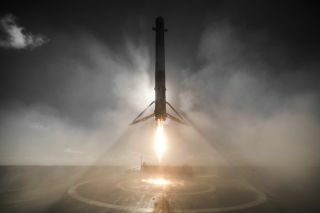 SpaceX has been landing Falcon 9 rocket boosters as part of a program to develop reusable rockets that can be flown over and over, dramatically lowering the cost of spaceflight. The company ultimately aims to build huge reusable rockets and colony ships to send people to Mars. SpaceX CEO Elon Musk unveiled that ambitious Mars colonization plan in September, just weeks after the Sept. 1 rocket explosion. SpaceX's drone ship landing pads are named after the giant sentient spaceships dreamed up by the legendary science fiction author Iain M. Banks. The Falcon rockets, in fact, are also named after a science fiction spaceship: the Millennium Falcon from "Star Wars."